As much as Rs 23 crore spent on developing the six-storeyed “C” block of the Government Medical College and Hospital, Sector 32, stands wasted. The building is ready for the past four months, but cannot be utilised as special lights for the operation theatre have not been supplied by the company manufacturing them. Students of Panjab University, who wish to appear as private candidate this year, need to be extra cautious in submitting their examination forms in time, lest they might end up paying at least 13 times more than the original fee. For over eight years now, Biju D has been into the business of energising the silver screen with effects too lightening to be explained. A day after her fast ended, student leader Annpurna Singh was back in her element today, indulging in what she likes the most—eating. “When we started the indefinite fast, we thought the Administration would give in within a couple of days. A number of Army officers residing in Chandimandir cantonment have complained of inadequate service from mobile telecom service provider, Reliance, with some of them are even moving the consumer courts in this regard. 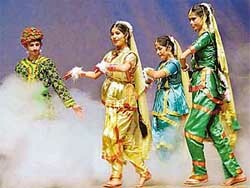 You do not have to get yourself enrolled with a troupe for settling abroad, illegally. If you are talented, qualified, and can contribute to the English economy in terms of skills and taxes, you can settle down in the United Kingdom — at least this is what city resident Ranjit Malhotra believes in. The Model Jail, Burail, appears to have become a major centre for carrying out criminal activities in the city and its surrounding areas. 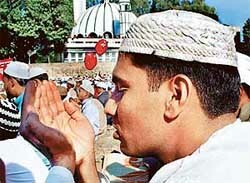 Id-ul-Fitr was celebrated with prayers in mosques all over the city and its surrounding areas. A large number of Muslims visited the Jama Masjid, Sector 20, the biggest mosque of the city. Maulana Ajmal Khan, Imam of the Jama Masjid, held the prayers this morning. On a recent occasion, I had to take a foreigner around Chandigarh. She was surprised to see that Chandigarh was a beautiful city, well laid, generally clean and had most facilities. To pay homage to Major Navneet Vats of Gorkha Rifles, who was killed in a militant attack in Srinagar on Saturday, Dr Viresh Shandilya, National President of the Anti-Terrorist Front of India, today visited house of the martyr in Sector 4 and expressed his sympathy with the family. 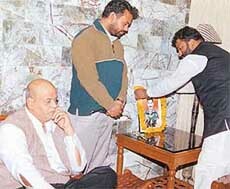 Dr Viresh Shandilya, national president of the Anti-Terrorist Front of India (sitting), Mr Ashok Valmiki and Mr Deepak Sharma, speaker and vice-president of the Congress Panchayati Raj, respectively pay homage to martyr Major Navneet Vats at his house in Sector 4 in Panchkula on Wednesday. Maya Academy of Advanced Cinematics, the famous training institute in animation and visual effects in the country has chosen Chandigarh as the venue for the finals of the first national level competition “24 fps Visual Effects Awards 2003”. Persistent child disobedience and non-compliance is a frequent troublesome problem for parents and is one of the most frequent reasons for referral to a child psychologist. A middle-aged resident of Sector 70 here was seriously injured when his car rammed into a stationary truck while trying to overtake an autorickshaw from the wrong side last night. The House Owner Welfare Society in Phase V here has demanded the development of a green belt behind the Civil Dispensary in the area. The police yesterday arrested Dinesh Thakur, a Mani Majra resident, and recovered 80 grams of smack from him. He was arrested from Mani Majra. He has been booked under Section 21 of the NDPS. An altercation between a Sector 12 shopkeeper and a customer over a pending bill payment has landed them behind bars. The problem started when Sanjay, a stationery shop owner, demanded the payment of a pending bill of Rs 450 from Mr V. Mehta last evening and the latter allegedly refused to pay. Ford India today inaugurated a new dealership, Bhagat Ford in the city. With this launch, Ford India now has seven dealer facilities in Punjab and Chandigarh. Mr V. Sivaramakrishnan, General Manager, Sales, (centre) Ford India, addresses a press conference after inaugurating the new outlet in Sector 26 on Tuesday. Entrepreneurs from the city, who are participating in the ongoing India International Trade Fair at Pragati Maidan in Delhi, are expected to generate trade to the tune of Rs 4 crore as some of the participants have already received orders from Indian and foreign firms. An enthralling musical extravaganza, “Jasma Odhan”, depicting myriad nuances of social fabric ranging from the majestic and mighty to the poor and downtrodden, was staged by the students of Bhavan Vidyalaya, Sector 27, to mark the annual day celebrations at Tagore Theatre, here today. Students of Bhavan Vidyalaya, Sector-27 presents “Jasma Odhan” a Hindi folk play being held at Tagore Theatre in Chandigarh on Wednesday. The 13th meeting of the Academic Council of PTU, Jalandhar was held at Chandigarh Engineering College, Landran, yesterday. About 40 Academic Council members reviewed the academic performance and upliftment programme of the university. To popularise science, a workshop on the subject was organised by the local unit of the Hindustan Scouts and Guides in collaboration with the Department of Science and Technology, UT, at St Stephen’s School, Sector 45, here today. Over 70 youth of Mullanpur-Garibdas village today participated in a kar-seva to level the ground opposite the S.M.L. 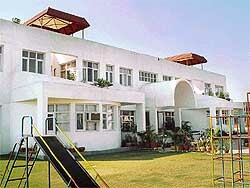 P Government Senior Secondary School in the village. Members of the village panchayat also participated in the kar seva. As per the orders of the state government to observe November 26 as anti-dowry day every year, students and staff members of Government College, Naraingarh, organised a function in this regard on the college campus today. 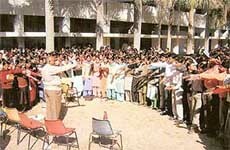 Students and staff of Government College, Naraingarh, take an oath before the Principal, Dr P.K. Aggarwal, to help eradicate dowry during the anti-dowry function held on the college campus on Wednesday. Studies at Government Elementary School in Phase V here are suffering due to the shortage of teachers. Ms Deep Kaur, Municipal Councillor of the area, said there were 150 students on the rolls of the school but it had only two teachers for five classes. Earlier, the institution had adequate staff. 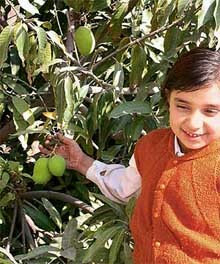 Anee’s School, Sector-69, Mohali, is being run under the aegis of Aggarwal Educational Trust, an NGO committed to the task of quality education among the masses. The management comprises people of calibre in the field of education, medicine, law etc. who took over this daunting task with an unwavering commitment. Being entrusted with the responsibilities of primary education is a colossal task for any one, be it the policy-makers, the educationist, practising teachers or the parents. All of us need to assume responsibilities ensuring that the child of today will grow up to be assets for the nation tomorrow. The police has approached the Spice Communications, a mobile phone service provider, to get details of 24 SIM cards seized from the illegal telephone exchange, which was unearthed in Sector 22 yesterday. The UT police today procured a production warrants against, Om Parkash Saini, who is alleged to be main suspect in the extortion racket busted by it. Rhythm’Z Infotainment’s “Radio Kaan laga ke” is all set to celebrate the success of its major programmes, especially the much-loved “Drive on”, which completes its 100th episode on Chandigarh FM tomorrow. Can you dream of a pollution-free, fast and cheap transport from the Panchkula bus terminal to the railway station, bus stand in Sector 17, Chandigarh, and the PGI? Yes, you can. Konkan Railway Corporation Ltd, (KRCL), which has executed a historical railway project between Mumbai and Goa, is offering this technology here through its sky metro project. 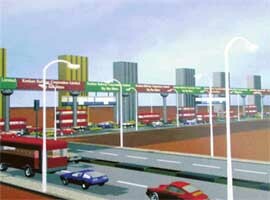 An illustration of the sky bus project, which can revolutionise public transport in city. 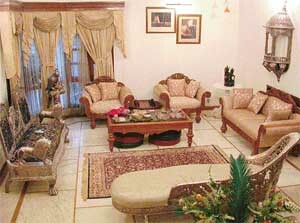 A riot of colour brings the romance of Rajasthan to the Chanana house in Sector 6, Panchkula. Encompassing the elements of light and air, this picture-perfect house shows the fusion of tradition and modernity. “I ensured that the house had a modern outlook, with its roots embedded in the Indian tradition,” says the lady of the house, Mrs Gauri Chanana. 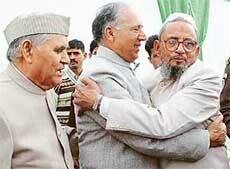 I hail from Ambala cantonment. My great grandfather, Mr Jaswant Rai, has been a well-known educationist of the area and remained the Principal of a local college for years. We have a big joint family at Ambala. . My father, uncle and many others are in the merchant navy. So they are away at the sea for long periods. But when they come home they are here for months together. Chandigarh’s first multiplex will be formally inaugurated by the Governor of Punjab and the Administrator of UT, Chandigarh, Justice O. P. Verma (retd), on Friday ushering in a whole new concept in mass entertainment. Christened Fun Republic, the multiplex is the first such facility in this part of the country offering as many as four cinema houses under one roof together with restaurants, food courts, shopping stores, kid’s play area, including video games and music stores. Fish dealer Ved Parkash Burgujar is all smiles with the prize catch — singhara — in Chandigarh on Wednesday. 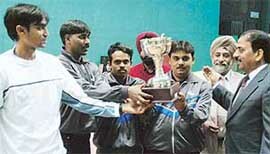 AG, Haryana, and AG, Uttar Pradesh, shared two titles each at the conclusion of the North Zone India Audit and Accounts department badminton championship organised here today at Sector 42 badminton hall. 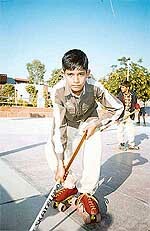 Gautam Rathi, a student of St Xavier School, Sector 20, Panchkula, won three medals in the 9th District Roller Skating Championship held at Blue Bird School, Sector16, Panchkula, on November 25 and 26. Rathi participated in all events (races and hockey) and won distinction in all events. This is the first time that St Xavier School participated in the tournament and performed creditably. Their junior team (boys) got a bronze medal. The Blue Bird Club, Sector 16, Panchkula bagged the sub-junior girls and junior boys titles while the Hansraj Club, Sector 6, secured the sub-junior boys title in the roller hockey event on the final day of the Ninth Panchkula District Roller Skating championship here today at Blue Bird School, Sector 16, Panchkula. The Netball Association of Chandigarh will hold the selection trials tomorrow to select the UT youth team (both boys and girls section) for the First National Youth Games to be held at Bangalore in January.